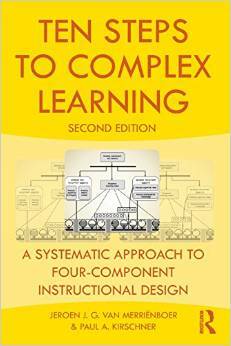 The Ten Steps to Complex Learning (available through Amazon US and Amazon UK) are a practical and modified version of the four-component instructional design model (for short, 4C/ID-model). Previous descriptions of this model had a descriptive nature with an emphasis on the psychological basis of the model and the relationships between design components and learning processes. Ten Steps are mainly prescriptive and aim to provide a version of the model that is practicable for teachers, domain experts involved in educational and/or training design, and less experienced instructional designers. www.tensteps.info. Are boys better in math than girls? Do we really only use 10% of our brains? Urban Myths about Learning and Education debunks the most common myths in education and learning and gives a concise overview of the proof behind the reality. Along the way, the authors discuss why these myths are so entrenched in the public consciousness and what can be done to retrain parents, teachers, policy makers, and the public to know better. This well-researched yet concise and light-hearted book discusses myths regarding what we learn, how we learn it, how we retain it, how the brain works, myths about education and technology, and myths relating to educational policy. The book is available through Amazon in the US and Amazon in the UK.